The most "American" vehicle isn't Built Ford Tough. It's not in jingles sung by John Mellencamp or Bob Seger, and it probably won't be kickin' up any backroads dust somewhere in the Heartland. 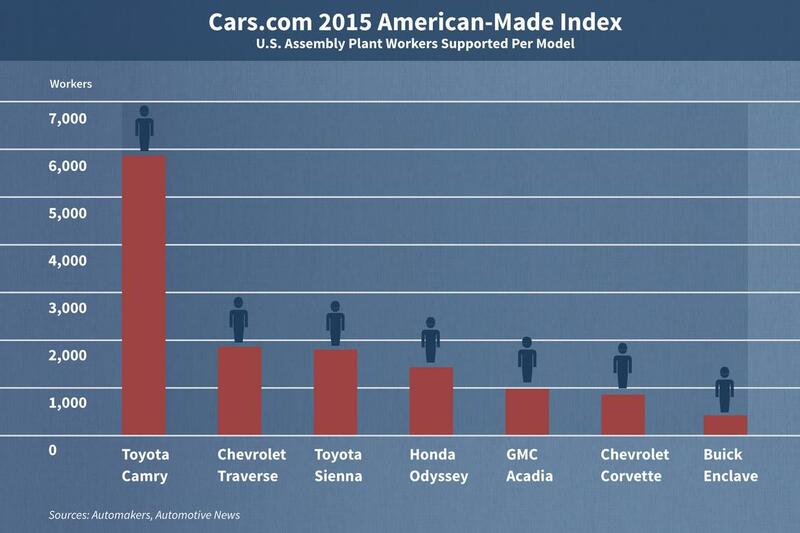 The Toyota Camry is the car with the most American-made content, according to Cars.com. The Camry is assembled at Toyota's Georgetown, Ky., plant as well as in Lafayette, Ind., through a partnership with Subaru. It supports 5,900 U.S. workers, far more than any other model of vehicle. For the first time in the American-Made Index's nine-year history, fewer than 10 cars have at least 75 percent domestic content. 2014's top vehicle — the Ford F-150 — fell below 75 percent in domestic-parts content with its 2015 model-year redesign.